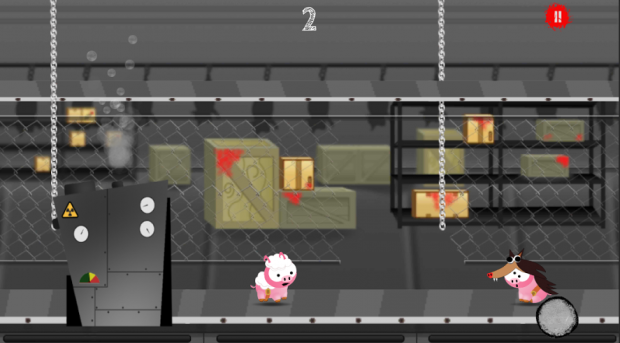 Bondiola is a gore funny adventure where player will have to save a little cute pig from becoming meat in a factory. Jumping over other pigs and avoiding other evil pigs is part of the story. Super farts and burps are some of the abilities of the hero of this game. We want to present the first costumes that are going to take part in the next release of our game. We have decided to introduce some skins that might add more color to the story. In this occasion, we have created a sheep/wolf skin to use on the main character and on the pigs condemned to die. This is the first skin that is going to be available and we will present the coming ones in the future. Please, feel free to download the last version in Google Play, give the game a try and do not hesitate to comment any suggestion, improvement or anything we can work on. Finally, remember, some ribs a day keeps the doctor away. Finaly Bondiola was released in Google Play. In this occasion we want to introduce one of the tougher enemies the game has in a good looking mexican way. We are almost ready for the launching! Nice Game!! Waiting for it!